'All About Presentations' by Jazz Factory: Visualise This: How to show 'gaps'? Visualise This: How to show 'gaps'? Yesterday I made a presentation. On one of the slides, was this information. This is a simple table which depicts the demand and supply of a product in 2001 and 2010. There has been a significant jump in the Gap (in absolute terms) and the presenter has to talk about the 'increase in gap'. This gap has to be emphasized. How does on present this information? Let us draw the bar chart and see how that looks. Let us now see how the line chart will look. How would you present this information? Will you opt for the table, the bar or the line chart or something else? The bar chart is used when we compare data. Since this slide is about comparison, bar serves the purpose. The line chart also does the job because it shows kind of a movement from 2001 to 2010. What did I do? I stuck to the old school table, purely because there are very few pieces of data in the table. In all just 6 data points. This is comprehensible. A visual approach might be needed when we have too many data points and it is tough to understand the essence from the table. Before we conclude, there is one more option I can think of. 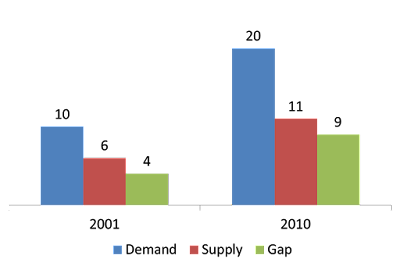 A customized bar chart. 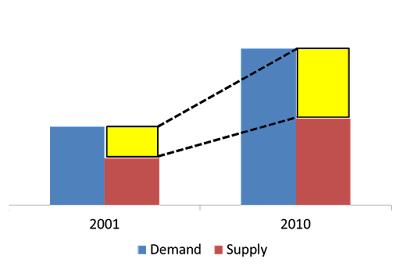 In the same bar chart, insert shapes (yellow) and connect them with dots. This will help audience focus on the growth in gap and the lines will carry their eyes from the small yellow to the bigger yellow. This customized version looks a bit more appealing to me than the other options. What do you feel?